That’s pretty impressive Bruce, but there’s something that The Hulk has that you don’t. Enormous green hands that are practically designed for smashing. You can keep all of you PhDs. We’d rather have some big ol’ green hands! Be honest. If you had giant green hands, like the big green lug, what would you use them for? Smashing. How could you not? The Hulk’s hands are designed for smashing stuff, so it’s really not much of a surprise that he mostly just uses his hands to smash. 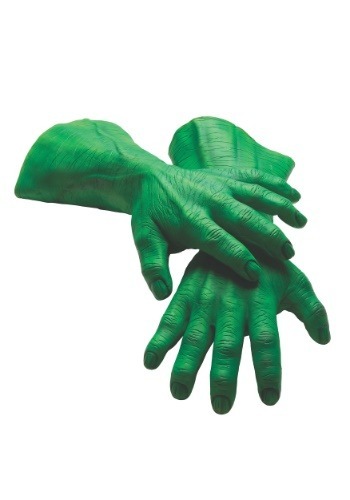 Well, now’s your chance to have some giant hands like the Hulk! These adult deluxe hands are designed to be won like gloves and are made out of latex. Just slip them on over your own hands and you’ll feel like smashing some bad guys! These Hulk hands are an obvious addition to extra detail to any Avengers cosplay. Of course, don’t go picking fights with Thor or Thanos! Even with these Hulk hands, you still might not have the super powers required to go toe to toe with one of these guys!